Chelsea v Manchester United – The Midfield Battle. The Midfield battle could be key in the outcome and it will be interesting to see how Jose Mourinho will look to deal with Antonio Conte’s new approach. I expect Chelsea to line up with the same players that started against Leicester with Matic & Kante in the middle and the two wingbacks out wide. It’s vitally important that we negate any space in front of our back three as that is an area we know Jose would look to expose. Jose will play with a number ten so we need to ensure that we pick him up when we do not have the ball. It’s what happens when we have the ball pushing forward that is more than interesting. How will United line up to combat our wingbacks? Who will play through the middle and who will start the game as their defensive midfielders? It’s obvious to me that Jose Mourinho missed a trick in the summer and failed to identify a natural defensive midfielder to come in and play what has become a vital role in the make-up of any side. At present, it looks like square pegs into round holes with the likes of Herrera, Fellaini, Pogba and Carrick all being asked to play there – all of them not naturally defensive. 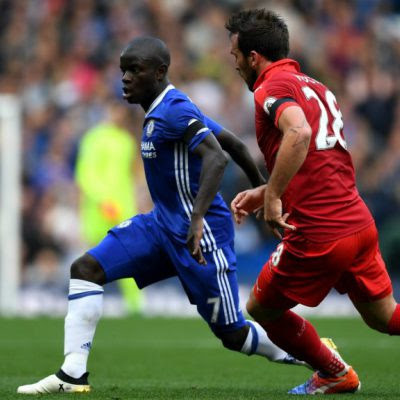 Chelsea must look to dominate the ball as Liverpool had done last Monday night but we must move the ball forward quickly. We cannot afford to get sucked into slow, sideways football. As soon as we win the ball back, we must use the natural width and look to turn United and force them backwards at every single opportunity. As it looks like Jose Mourinho is struggling to figure out what his best team is, Chelsea seem to have turned the corner and all of our midfield need to give us a 100% better performance than we had witnessed against our other top four rivals earlier in the season!.